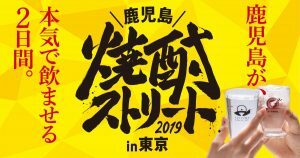 13 Kagoshima shochu distilleries will be conducting a mini Shochu Street event in Tokyo on March 2nd and 3rd. One thousand yen gets you five drink tickets, an exceptional deal! 12 PM - 7 PM on both March 2nd and 3rd. Kanpai!